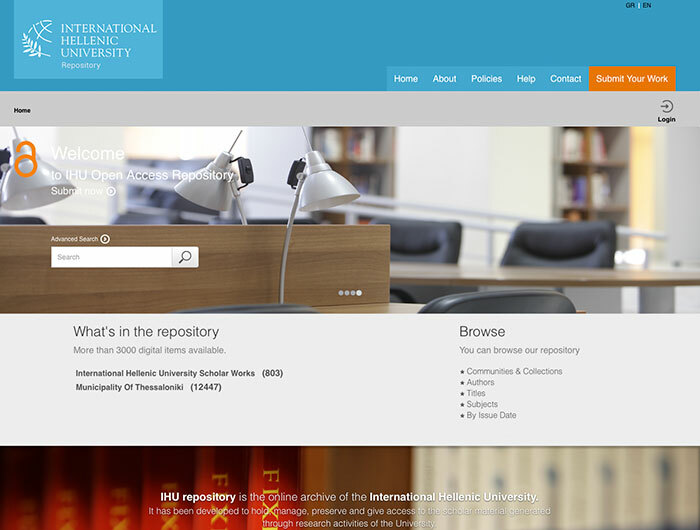 The main objective of the project was the creation of a modern institutional repository that met the needs of the IHU. The need for enrichment of existing services and the university’s library material was compelling with priority to ensure access for all citizens to innovative digital services. Specifically, the need for access to scientific / research material produced by the IHU e.g. studies, publications, etc. was indisputable. In addition to a significant number of graduates' works, IHU’s academic community produces a number of scientific articles and papers in journals and conferences of international prestige. This produced wealth constitutes a large part of the annual scientific activity of the IHU and part of the “gray literature” that largely remains unexploited, since it is not collected, not indexed and is not searchable by a public access site. The project was awarded to Realiscape Typorama through open competition. Through the implementation of the project, our company digitized and documented multiple thousand pages of the University's material, and created the IHU Repository on the DSpace software platform, which was hosted in the GRNET infrastructure. The creation of the IHU Repository had a direct effect on the visibility and openness of the Foundation, since search for material contained in the repository is also available to third parties through the OAI-PMH protocol, both for metadata and full text.